Discussion in 'Cycling Equipment' started by lspeedguy, Jul 2, 2018. My current wrap is overly cushy/puffy and I'd like to replace it with something moderately cushy - any suggestions on which brands offer a reasonably good range of wraps that maybe extend from thin and skin tight at one end of the spectrum to overly cushy/puffy at the other end ? Could someone recommend a substitute for 3M electrical tape as the finishing or anchor tape - somehow that stuff stretches/separates and gets too sticky in hot weather and is an annoyance when the hands are on the tops ? Thanks in advance for any thoughts . I like Fizik 2MM Classic finished with the supplied finishing tape. I cover the finishing tape in heavy, clear packaging tape cut down to 3/4" width. thanks Bob , Fizik also has a nice range of wrap thicknesses ; their website shows wraps at 2,2.5, & 3 mm . I agree with Bob, oh oh now I'm in trouble! But Fizik is the best I've found too, it cleans the easiest of any tape I've used, it doesn't get slick when wet, it can be bought with middle of the road thickness and cushioning as Bob pointed out, and it comes a wide variety of colors. Although clear packaging tape doesn't hold up as well as even the standard electrical tape most people use when it gets repeatedly wet (or sweat), instead I use black (comes in white too) Gorilla tape, this stuff will last a very long time in fact a lot longer than electrical tape, and it's a bit thicker then the others as well giving it more of a similar match in thickness, plus it has a very slight pattern to it instead of glossy smooth. Of course with clear tape it means you don't have to scream because black or white tape won't match your bar tape. 3M also makes a range of colored tape but it won't stick as well as the Gorilla tape, but you stand a better chance of finding a color match if you're into that sort of thing. You can for an added twist, and have an unusual look, which will outlast any tape is to finish the ends with hemp (and only hemp, anything else won't work) twine, you can google it to see how to do that if you're interested, you can then, once you twined it, is to shellac it which darkens the twine, and you can get it darker the more shellac coats you put on to match light or dark bar tape better, it gives your bike a more natural look which a lot of people like these days not to mention a conversation starter, again google that as well. My thing is why would someone buy a $1,500 plus bicycle and put cheap looking black electrical tape or clear packaging tape on it? Thanks Froze - I just picked up some Gorilla tape and just finished a re-wrap using it - on the pro side the adhesive is very good but on the con side it tended to wrinkle a bit when I stretched it around the bar - good quality electrical tape , e.g. Scotch 3M is much thinner but even more importantly it stretches better than the Gorilla which I think gives the wrap a nice tight look . I put one wind of Gorilla and then put a couple of tight winds of electrical - it looks good & isn't sticky - in my case I think my bike shop wrapped one side Ok and the other not so good . And I'm just relaying my experience and only my opinion of the Gorilla - thanks again . Yeah it doesn't stretch like electrical tape but if your careful it does stretch a tiny bit, but electrical tape is quite thin vs Gorilla tape so naturally it will stretch more, so the lack of stretch for Gorilla tape is a situation to be aware of but I don't call it a problem. Thanks for bringing that up the stretch issue because I forgot about that since it was about 5 years ago I retaped a handlebar and used the Gorilla tape. I never put anything over the Gorilla tape. I have found that electrical tape will last about 2 to 3 years and then I have to replace it, but the Gorilla tape has been on now for 5 years and it doesn't need replacing. I do need to revise something I said in my first post about Gorilla tape which I found out about today. White Gorilla tape is not as strong as the black at holding, not sure how strong the white tape is vs electrical tape since I've never used it, but if you want the ultimate in holding and lasting stick with black. I may experiment with the white just to find out how long it will hold, because my commuter bike yellow 3M tape is beginning to come off, so I may buy some of the white Gorilla and see what happens since the bar tape on that bike is white. Thanks Froze , I probably should have been more patient with the Gorilla because I checked the wrap this morning and the electrical tape felt sticky - the supplied finishing tape that comes with the Fizik wrap that Bob alluded to is probably the ideal - the feedback from yourself and Bob has convinced me to order the Fizik at the middle ground 2.5mm . Thanks again to both you and Bob . I'm using exclusively Shimano bar tape now. It is moderately cushioned and it is extremely easy to apply properly. I was never able to bet Fizik to wrap easily. What seems to be difficulty with wrapping Fizik? I can't recall having any issues with Fizik wrapping. But I like Fizik because it cleans easily and cleans well. I like Lizard Skin DSP bar tape the best though but when I needed tape ASAP my LBS only carried Fizik. I also like leather tape but it doesn't clean as well; and I like natural cork as well but it doesn't last a long as the others, and some say it doesn't clean well but I've used 409 on it and never had any problems cleaning it, but cork is fragile if I stretch it to much it just breaks off. 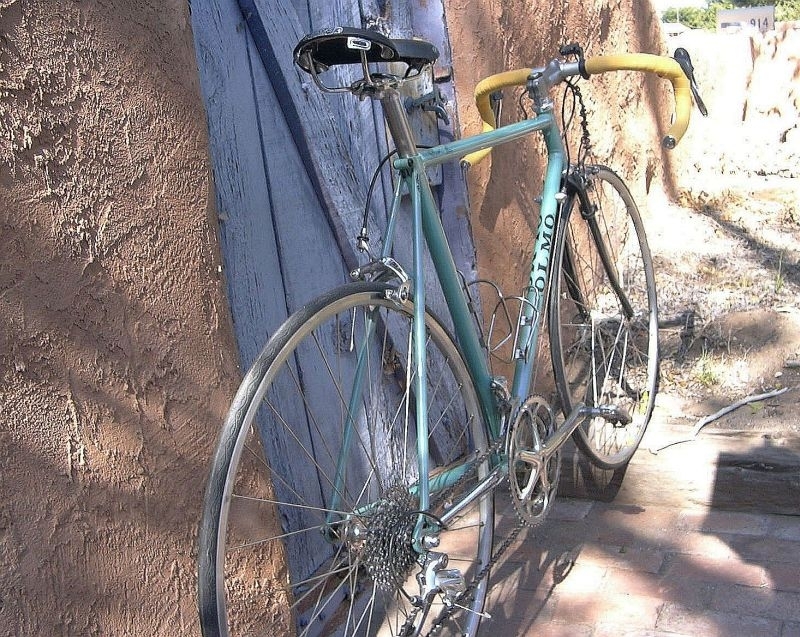 I even had a bike, the Miyata 712 I sold 2 or 3 weekends ago that had the ORIGINAL vinyl bar tape and it was nice tape. So I like several different types of tape. I can't recall what brand of tape I didn't like, there were a few. If I start from an empty bar, I’ll put two rings of hot shrink tubing on first, slide over the wrap and use to secure the inner ends. Think I'll Try My First 50 Mile Ride In The Next Couple Weeks, Any Advice?